Pablo Picasso was the quintessential artistic genius of the 20th century. Importance in intellectual disciplines is a function of influence, and Picasso's influence makes him not only the greatest painter of the modern era, but the greatest artist overall, for his innovations spread throughout all the arts. Thus Cubism directly affected major movements in sculpture, photography, and architecture, as well as painting; his innovation of collage affected all these arts, as well as films, poetry, and the novel; and his innovative practice of changing styles frequently and at will spread widely throughout the arts, affecting figures as diverse as Marcel Duchamp, John Cage, Jean-Luc Godard, Gerhard Richter, Bob Dylan, and David Bowie. Considering all disciplines, only Albert Einstein has emerged in the public consciousness as a symbol of genius comparable to Picasso in the modern era. Both were classic examples of conceptual innovators. Pablo Picasso, Two Saltimbanques (1901). Image courtesy of the Courtauld Gallery, London, UK. Picasso's enormous fame makes exhibitions of his art consistently popular. 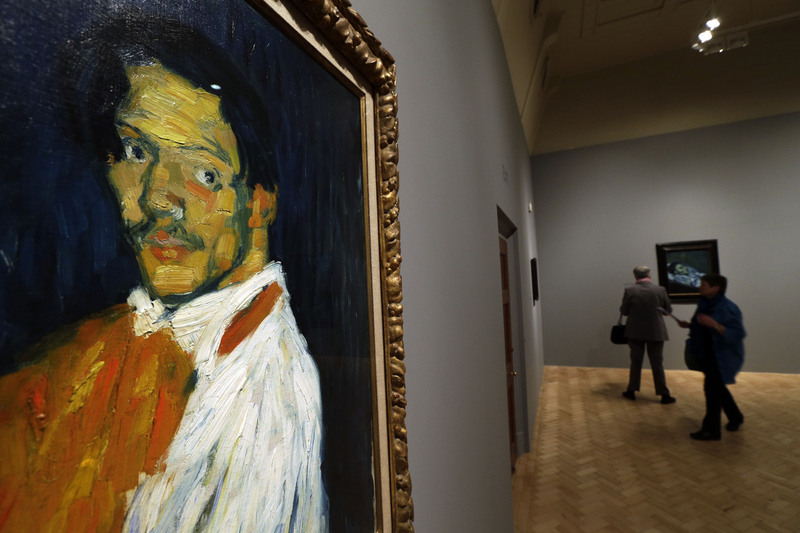 Crowds are not a familiar sight at London's little Courtauld Gallery, but its current exhibition, Becoming Picasso, has broken all the museum's attendance records; for the first time the gallery has introduced a queuing system, complete with timed-entry tickets. And this in spite of the fact that the exhibition does not present Picasso as an innovator. Pablo Picasso, The Blue Room (The Tub) (1901). Image courtesy of the Courtauld Gallery, London, UK. 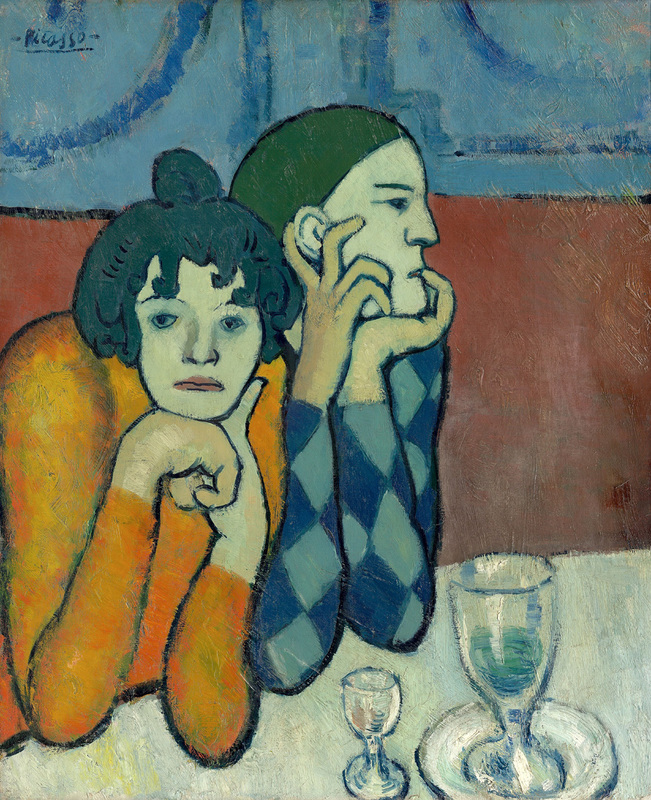 The 18 paintings in the show were executed by Picasso in 1901, when the 19-year-old artist first settled in Paris. Picasso would not become a great innovator for another six years, when his landmark Les Demoiselles d'Avignon would explode upon the art world. In 1901 he was in search of an identity, and we see him being influenced by many of his great predecessors in Paris' art world. 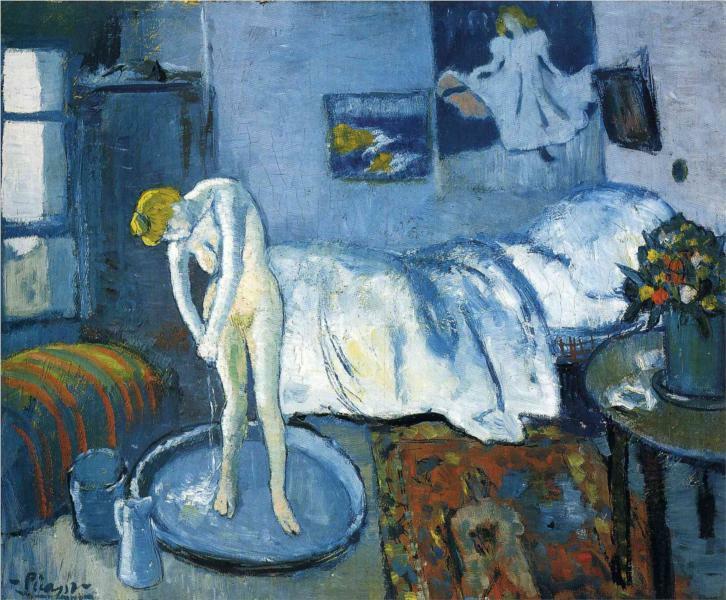 The Blue Room (The Tub) portrays a woman bathing in a typical Degas pose; on the wall behind her hangs a Lautrec poster of May Milton. In the arresting Self-Portrait (Yo-Picasso), the thick impasto, crude brushstrokes, and searching gaze show Picasso paying homage to van Gogh. Pablo Picasso, Self-Portrait (Yo-Picasso) (1901). Image courtesy of the Huffington Post. In 1901 Picasso had not yet discovered Cézanne's innovations in form, and even at this early date he had no interest in the shimmering colors of Impressionism. Although he had not yet become an innovator, his ambition, the force of his personality and his enormous self-confidence are powerfully projected by these early works, and were clearly recognized by contemporary critics. Félicien Fagus observed that "Picasso's haste has not given him time to forge a personal style; his personality is in this haste, this youthful, impetuous spontaneity," while Pere Coll correctly noted that "at his age I doubt there are many who have done what he has." Pablo Picasso, Portrait of a Man (1901). Image courtesy of the Courtauld Gallery, London, UK. Picasso's eventual success was a product not only of his artistic virtuosity, but also of the shrewd entrepreneurial ability that made him the first artist to understand the freedom that was afforded by the emergence of a competitive art market in the early 20th century. 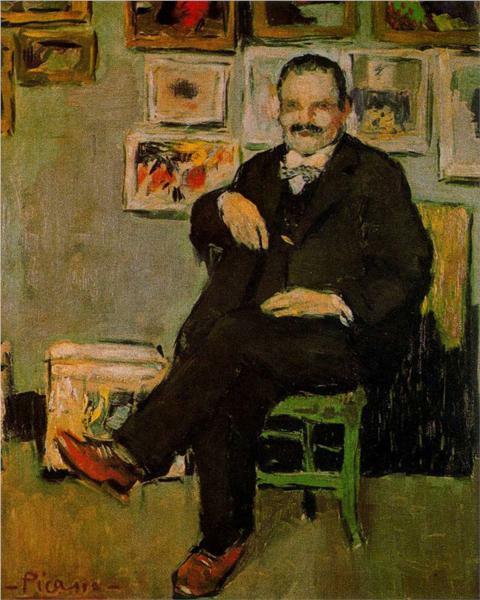 And this business acumen is equally on display at the Courtauld, in Portrait of a Man, whom Picasso's biographer John Richardson identified as Ambroise Vollard, the respected dealer of Cézanne and Gauguin, who gave Picasso his first Paris gallery exhibition in 1901. Picasso's cultivation of powerful figures in the art world, who could enhance both his fame and fortune, made him a forerunner of such later innovators as Andy Warhol and Damien Hirst, who are also among the select few whose exhibitions can produce excitement and long lines at great museums. 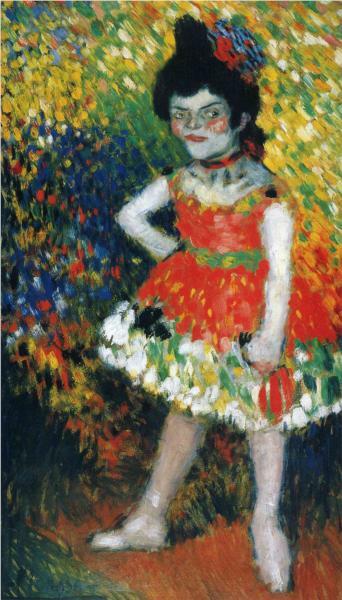 Pablo Picasso, Nana (1901). Image courtesy of the Courtauld Gallery, London, UK. Meyer Schapiro wrote of Picasso that "There is no example in all history of another painter who has been able to create such a diversity of works and to give them the power of successful art." In this, Picasso was a prototype for many later conceptual artists, who deliberately work in a number of discretely different styles, and often genres. Becoming Picasso demonstrates clearly that Picasso's avoidance of a single consistent style was present at the very beginning of his career. The exhibition also strongly suggests why Picasso followed this practice. These works reveal a young artist who was in love with painting, because it allowed him to express his ideas and emotions, and for the benefits it could bring him, in fame, fortune, and power. 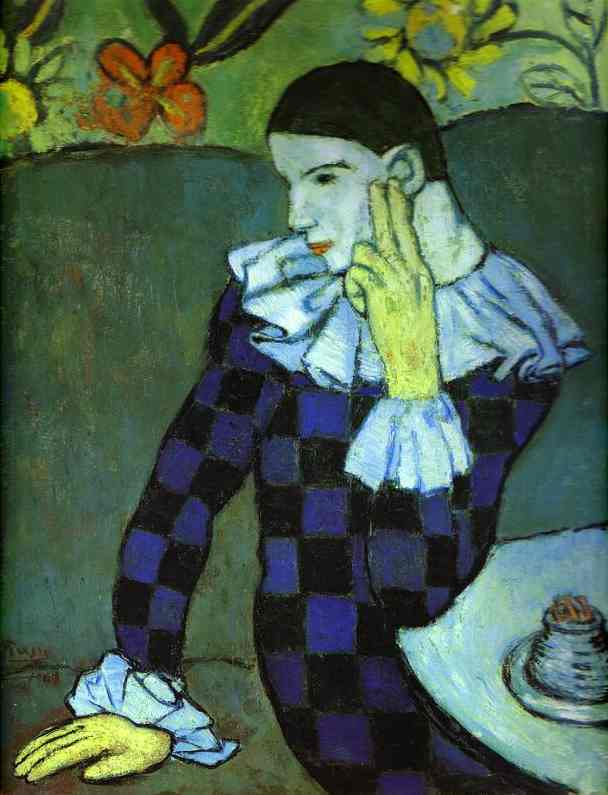 Pablo Picasso, Harlequin (1901). Image courtesy of the Courtauld Gallery, London, UK.